The Biologic Effects of Ionizing Radiation report was initially requested by the U.S. Environmental Protection Agency in 1996. Since then, there have been several revisions of the BEIR report, the last being the BEIR VII Report in 2005. BEIR VII was different in that it also looked at the effects of low dose (<100 MSv) radiation on humans. 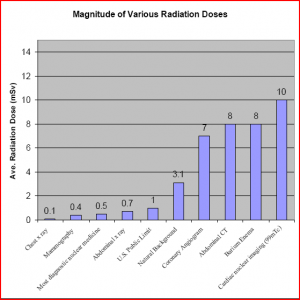 BEIR VII estimated a 1:1000 risk for cancer from one 10 mSv exposure to radiation. This is the radiation exposure from one abdominal, pelvic, or chest CT. These are imaging studies we order very commonly in our practices. In fact, there were over 70 million CT scans ordered in the United States in 2007 with projections that this may cause 29,000 future cancers. No one really knows whether there is significant risk from one CT scan. These estimates of risk are based on an analysis of large populations over time using a linear non-threshold extrapolation. However, even if the risk from one scan is small, it is not insignificant and people are exposed to so many studies over a lifetime. Background exposure to natural radiation in the United States is about 3 mSv per year (mostly from radon). 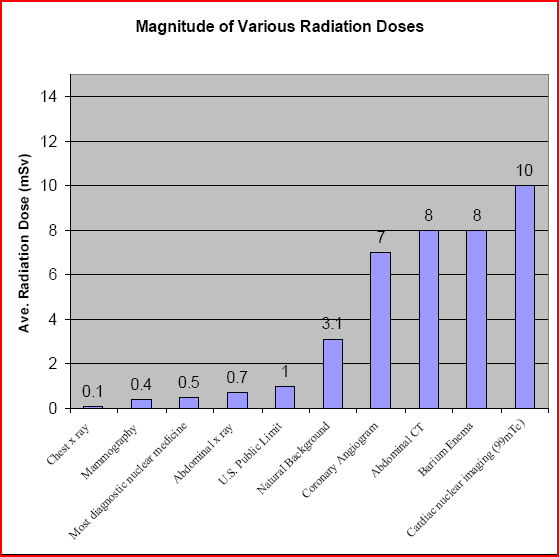 In 1980, the average radiation dose per person in the U.S. from all sources was 3.6 mSv per year. However, by 2007, the average dose in the U.S. had nearly doubled to 6.2 mSv per year. CT scans have become the biggest source of radiation exposure to humans after background radiation. The risk of cancer varies by age and gender. The risk of cancer is much higher for those under 20 years of age and for females. We need to be especially careful in imaging children. There are over 7 million CT scans performed annually on children in the U.S. Pediatric radiologists practice ALARA (as low as reasonably achievable) in imaging children, but nothing is better than judicious ordering to protect our children. The radiation dose our patients receive varies by the type of study. Although plain films do not expose our patients to large doses of radiation, a CT of the abdomen or a barium enema is equivalent to about 750 chest x-rays, or more than 3 years of background radiation. So yes, we need to be careful in ordering CT scans or other high-dose radiation imaging for our patients. This is our problem since the best predictor of radiation exposure in a population is the number of physicians in practice in that community. You recall that Part I of this blog briefly referenced several recent developments in infectious diseases. Part II, here, will delve into a few that deserve greater attention.